I would like to wish all my readers, wherever you are, a very happy Christmas full of enjoyment and peace. While it’s snowing madly in much of the northern hemisphere, today is a typical Top End Christmas with overcast skies and rain veering between sprinkles and tropical downpours. The pleasure of that is the temperatures are quite mild and we are not all hot and sweaty. Christmas wishes from the Northern Territory. 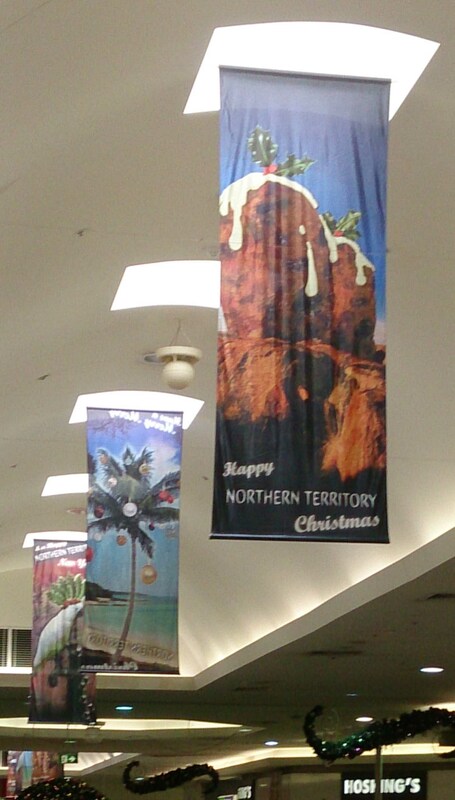 Images from the Xmas decorations in the Palmerston shopping centre…very NT. It’s the Dry Season in the Top End and as usual Darwin has been humming with activities, but this month it reaches a crescendo of activity with the Darwin Festival. August in Darwin is filled with such amazing opportunities: Indigenous singers and performers, international artists, the Aboriginal Art Festival, the Telstra National Aboriginal and Torres Strait Islander Art Award and exhibition, plus free concerts, cultural displays and markets. Throw in the fighter jets in a multi-nation Operation Pitch Black 12 and the associated Open Day on the RAAF base for all the aircraft junkies in our midst (count me in!). And for some outdoor fun, a visit to the new waterpark at Palmerston with its huge water slide (scary…eeek!). We’ve had an excellent few days over the weekend with a flying visit from our daughter who now lives in Kenya and the fun we’ve packed in as a family having all sorts of “adventures” around town. It’s great to have all the kids and grandchildren in one place even for a short time. So much excitement in a few days that I was plumb tuckered out last night. If you’re interested in any/all of the fun and games, why not pop over to my photo blog Tropical Territory and see what’s going on. And for today’s laugh I share with you a quote from this morning’s world-class (hah!!) newspaper, the NT News: “Beyond the quest for gold, silver and blondes in the final days of the Olympics…“. I kid you not! Well it was in the sports pages, but even so…The story’s theme was the craze for athletes to get Olympic tattoos to celebrate their participation. Aussie swimmer Ryan Napoleon was warning about the need for caution as he’d seen one tatt that said “Oylmpics”. I reckon “I won an Oylmpic blonde” would go one better! 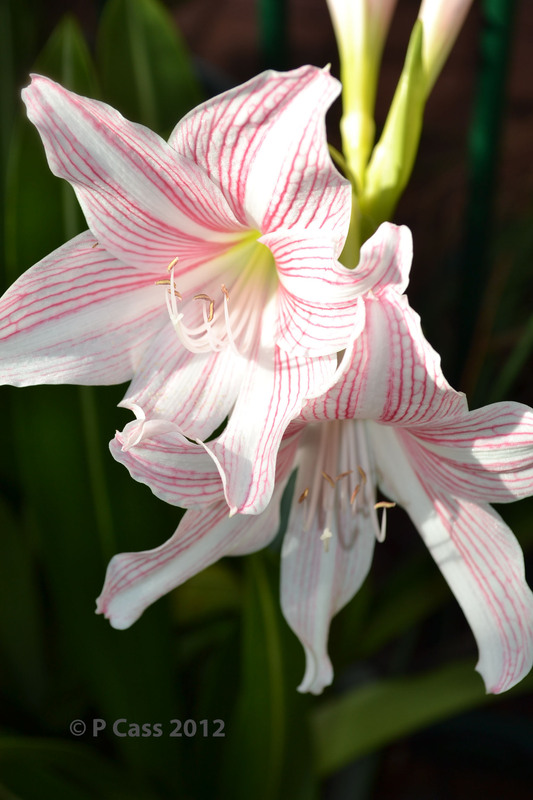 Hippeastrum and lily borer: treatment tips for the tropics? I think it’s a Hippeastrum not an Amaryllis, but it was gorgeous. There I was yesterday morning quietly eating my breakfast while perusing the garden. First I saw that the possums had been wreaking havoc on my new tomato bushes…nothing new there. Need a new strategy. All of a sudden I realised my pot of beautiful Hippeastrum plants looked like a plague of phytophthera had hit it…the leaves were like mush and wilted and in short the whole thing looked on the brink of death. Porridge forgotten I shot into the pool area to see what was going on. As I pulled one leaf after another from the plant, landing mush-like on the ground I had images of my Irish ancestors checking each potato tuber after the Blight had infected their food source. At least I was only obsessing about some flowers, not my food and sustenance. But I wasn’t happy! You can see the borer track and how it’s turned the bulb reddish. Then I noticed there were some black and white-striped caterpillar/grubs on some of the leaves (no photos of my own, too busy killing!). One thing led to another and I kept finding more of these critters. 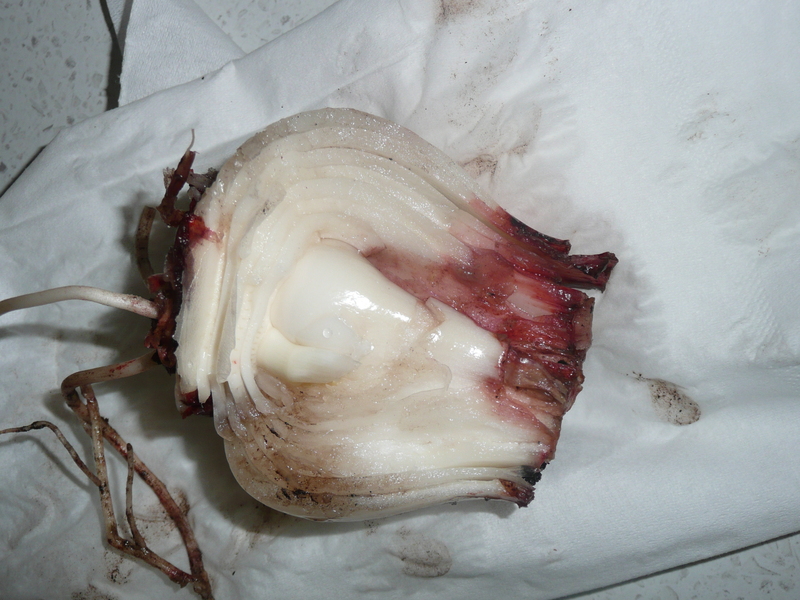 Don’t know why I pulled up some bulbs, but they too were going mushy – and there were worm holes down which the grubs had burrowed, cutting through the bulb in a wormy tunnel. Well I sliced and diced, stamped and stomped, battered and pulverised every one of those little *** I could get my trowel on. Stuck skewers down the tubes and squished with all my might. No grotty little grub messes with my flowers! This is one of the little monsters that caused all the trouble…long since deceased. In the end I sorted out which bulbs will probably not survive, though I replanted them in the contaminated pot, which I hope I’ve cleared of bugs. The healthy-looking bulbs I’ve planted in another pot, with my fingers crossed. Then I remembered that last week there’d been a maze of tiny fruit-fly sized flies around the adjacent Thai basil. Were the two things connected? Spotting some more of the flies I zapped them with common house fly spray. 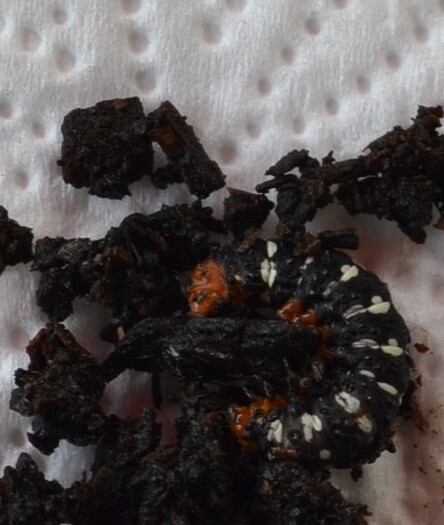 A good deal of googling suggests that those wretched grubs are lily borers and they are remarkably efficient in decimating a plant. I’m still not sure if the flies are linked to the grubs but I’m thinking so. Some comments suggest these grubs are incredibly difficult to control but I’m hoping my homicidal tendencies have taken care of them. I’ve also learnt the bulbs themselves are toxic – kind of handy to know when there are children around. I’ve had them in the pot for about 4 years (and yes, I should have divided them up), and they get a steady amount of water and during the Wet Season they’re deluged. Ironically the rain had dried up in the past week and the temperatures dropped. Typical for this time of year, but did the changed conditions contribute to the infestation or was it just bad luck? But what of my remaining bulbs? Any suggestions? Can I save them? There’s really no point in replacing them while these voracious monsters are still potentially in the garden. Update 19th May: I sprayed the pots several times with a mix of water and tabasco sauce, as per some clue I found on the web. Whether it works in the long term remains to be seen but at least I’m now seeing some little shoots regrowing. Fingers crossed. Yay!! 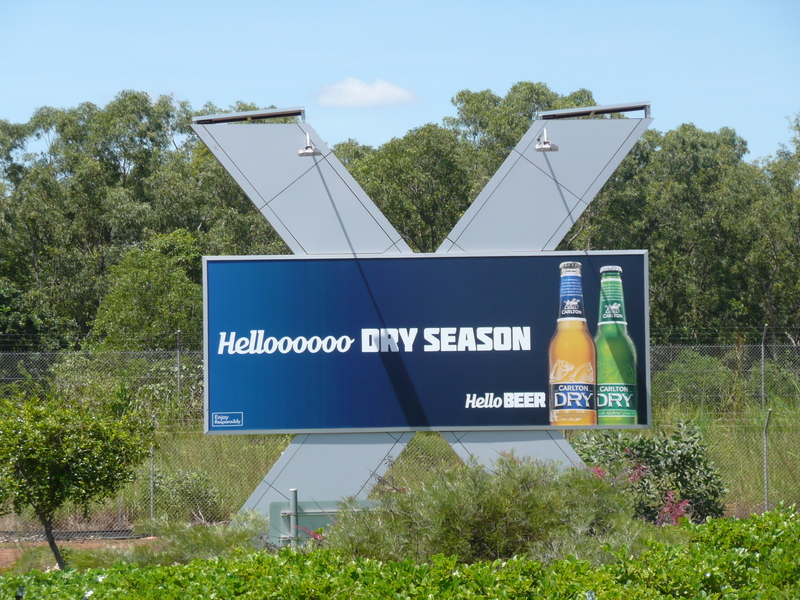 It’s the Dry Season – no rain, cool weather, lots of fun events around town. Yes, I know it’s a beer ad, but it’s clever, and this is Darwin after all. Amy Coffin of the We Tree blog, in conjunction with Geneabloggers, has a new series of weekly blogging prompts for 2012 and the theme is 52 Weeks of Abundant Genealogy . The topic for Week 8 is Genealogy Libraries: Genealogy libraries (and dedicated departments in regular libraries) are true treasures in the family history community. Tell us about your favorite genealogy library. What or who makes it special? The more I reflected, the more unfair it seemed to single out just one library, so here’s my tribute, with fanfare, to the family history libraries in my life. Like choosing between your children, picking your favourites seems unjust but I’d like to give my trio of Genie Awards to the following: GSQ, LDS Family History Centre(s), and County Clare Library, for their contribution to my family history. Read all about my credits below. My family history would probably have languished in the “I wonder where my name originated” basket, had I not happened upon a Colonial Street Fair in William St, Brisbane in 1986. GSQ had a “get ’em interested stall” and over 25 years later, the rest, as they say, is history. Not only did GSQ launch my family history search, but it fed and fuelled it for a very long time until I moved to Darwin. In those pre-digitisation days, I used to visit the library to search their hard copy documents but also their rolls of microfilm and especially their wonderful and vast set of indexes prepared by family history centres around the country. They also had special interest groups and when possible I attended their sessions. The GSQ seminars were goldmines of information to new genies like me, and I made sure I mined them to the full. GSQ also established a Pioneer muster register to celebrate the Bicentenary in 1988 and I submitted my own family trees, such as it was after 12-18 months of research (info was much slower to find in those days). The register was updated for Q150 in 2009. So GSQ Library is my first and biggest trumpet fanfare of thanks! Darwin's Family History Centre and the Church of Jesus Christ of Latter Day Saints. 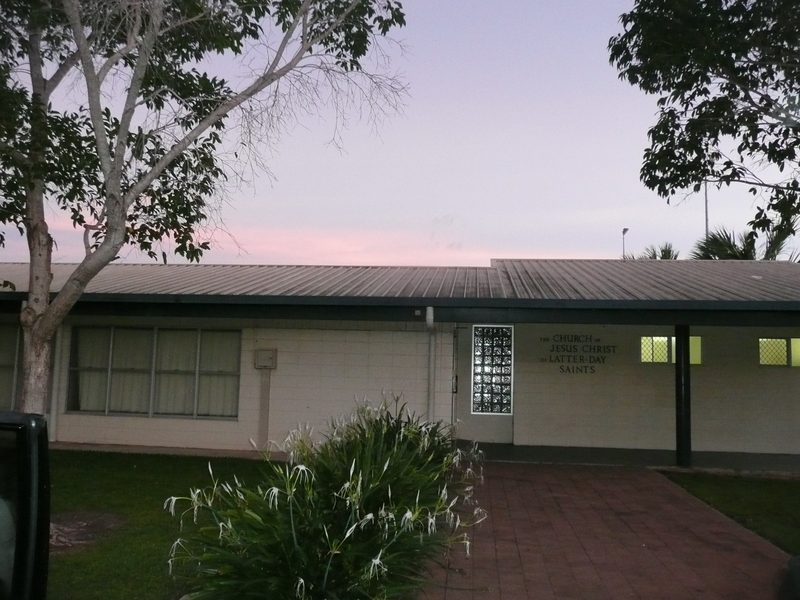 If I was pinned down to one library I really couldn’t do without right now in 2012, it would be the Darwin LDS family history centre. Not at all like the flash Salt Lake City facilities, it nevertheless provides me with access to all the diverse records microfilmed by the Church of Jesus Christ of Latter Day Saints (Mormons). The films may take their time venturing across the seas but when those films arrive they provide the gateway into so much of my family story, especially when it takes my stories back across the seas to England, Scotland and Ireland (sadly my German village records are not filmed). I continue to harp on about how wonderful they are, so I’ll let you read someone else’s story about why they’re genealogical gold. It bemuses me that researchers just don’t seem to “get” how much they can learn through the Mormon library: it’s just not instantaneous and perhaps that’s the problem in our impatient world. You could search my blog and find many references to this wonderful library. An innovator over many years I can’t sing their praises highly enough. If you have Irish ancestry, you want them to come from Clare so you, too, can benefit from the riches on their website: this is a virtual library you want to visit, trust me. Even if your Irish family comes from elsewhere have a look on the site to see just what may lie hidden in your family’s county of origin. And if you’re lucky enough to visit Ennis, as I have been, calculate the time you think you’ll need then multiply it: they have riches galore. My other drum-rolls are for these libraries that have served me so well over the years. Each has wonderful research opportunities that have contributed to my own family histories and can do the same for yours. To each I say “Thank You!”. In my early research days, SLQ was then housed in William Street (and if my memory serves, staffed with Shauna Hicks among others) and became another home-away-from-home. Here I again used BDM microfiche, microfilmed newspapers, and that wonderfully old-fashioned thing, reference books. In those early days I don’t believe I had ventured into John Oxley Library but when time permits on Brisbane visits there are always things to follow up. With family in the Darling Downs, as I soon discovered, TDDFHS had an impact on my research long before I joined the society or visited their library. GSQ held their index to BDM events in the Darling Downs Gazette and this was the key to learning more about the lives of my ancestors. TDDFHS have continued to hold a place in my genie heart with their local indexes especially their published books of newspaper extracts (especially great for “my” Germans). Because I live so far away I rarely get into the physical library but through membership emails etc I’m kept up to speed with what they’re doing. I must mention QFHS even though I visited them infrequently because they were on the other side of town when I lived in Brisbane. These days my Brisbane visits are so time-constrained that I rarely make it to the actual library but I’ve gained so much from the resources they produce. Their Hamburg shipping indexes, school admission lists, electoral rolls, and so many other indexes and services are fantastic resources. Some of the information you’re finding on Findmypast, for example, comes from their indexing work. Hidden heroes! They also awarded me a prize in 2004 for my family history – a huge buzz for me! QFHS had a great Q150 project, Queensland Founding Families, for 2009 and if you have Qld family it’s a must-read. With the encroachment of Trove and online subscriptions, NTL hasn’t seen me as much as they used to. Their wide range of newspapers has often been a godsend to me in following up leads and where they don’t have them in house, NTL is efficient in ordering them in on inter-library loans from The National Library of Australia and similarly books that I need or want to suss out, are dispatched from Canberra to far-away Darwin for researchers like me. Thanks Ken for your wonderful service with these loans! Always very much appreciated. NTL also hosts or co-hosts family history seminars throughout the year and includes family history, and history, journals and magazines for reference. They also have a great facility for people to tell their Territory Stories via online submission so if you have a family member who lived in the Territory in the past, you might want to put your entry there. I’ve spent many hours at GSNT scrolling through Board Immigrant Lists searching for east County Clare immigrants. There were some wags who thought I was going to grow cobwebs! Tucked among the bookshelves are a wide variety of reference books to assist with family history and the microfiche and CDs provide further opportunities to round out what’s known about our ancestors. GSNT also holds an extensive pioneer register which hasn’t been of interest to me previously but I’ve now learnt that one of my family connections was in the Territory so I’ll need to see what they may have on them. Thank you to each and every one of these libraries, without which my family stories would be just a litany of names and dates! Last night we were in the audience for the world premiere screening of the documentary, The Bombing of Darwin, an Awkward Truth. The Darwin Entertainment Centre was filled close to capacity with old servicemen and their families, Darwinites old and new, and visitors. We were rewarded with a very engaging and educational documentary based on a book of the same name by Peter Grose. Recurring comments are that people had known next to nothing about the bombing. You too can see it if you have cable TV as it shows on the History Channel on Sunday night in Australia and can also be bought from the Australian War Memorial after this week. I don’t have the film-reviewer skills to phrase these comments effectively but let’s see if I can give you the flavour. Great archival film footage from the National Film and Sound Archives and the Australia War Memorial though little is from the day of the bombing. An effective merger of the archive footage with staged reproductions – filmed in sepia or black and white ensured they blended well together. The interviews with the now-aged servicemen interspersed through the doco were extremely effective: dry, and often amusing, and revealing of the poor level of preparation for a war on Australia’s soil. Their memories of the fear were clear to see. The men’s youth was shown subtly with images of them in uniform occasionally shadowed behind them as they spoke – they were so young and it was interesting to see how similar they were to their youthful photos irrespective of ageing. The recounting of facts like burying bodies or finding men with their skin boiled off by the burning oil, simply told. It revealed the ensuing chaos, lack of leadership, and the real fear and expectation that the Japanese would now stage an invasion on Australian soil. After all “impregnable” Singapore had fallen only days before. The sheer good fortune of those who survived despite the odds, including the post office worker who didn’t hide in the PO’s secure trench –which took a direct hit. The “warts and all” approach of honesty in regard to looting and the ambiguity of military directions. Includes references to the Indigenous people and their experiences. The film will be shown to history teachers at the National History teachers upcoming conference and included in the teaching curriculum. The map which showed the spread of Japanese control to include Papua New Guinea though this never fell to the Japanese and was heavily contested in fighting with Kokoda and the Battle of Milne Bay key defensive successes. (We lived in PNG so knew the back-story to this). Discussion over how much looting took place and whether it was for profit or much-needed supplies. Discussion over whether some units were left in Darwin. Dispute over the “Adelaide River stakes”: the mass departure of civilians from Darwin after the bombing: a wise strategy if you think you’re about to be invaded. There were a large number of servicemen in the audience who had survived the bombing and it was impressive to see their general level of fitness and mental clarity as they were all very elderly. The documentary is certainly well worth watching if you get a chance. There’s a short trailer for it here. Yesterday I flew interstate on an unexpected trip to Brisbane. So what you might say…well, while I’ve made this journey many times, for some reason yesterday’s flight paths were out of the ordinary. In Darwin, we took off in a westerly direction from the runway, all well and good except Brisbane is south. However the bonus was that we did a wide circuit over the harbour looking at the Wet Season green of the vegetation, the rivers and coastline fringed with white sand, the boats in the marina at Cullen Bay and out on the harbour. The sandbar near Cullen Bay was exposed, something that happens when the tide is particularly low. You could see the waterfront complex and all the new high rises in the city. As they tell you on the guided tours, Darwin harbour is about twice the size of Sydney’s world-renowned harbour so it’s impressive. You’d be forgiven for thinking, as you look at this tropical magnificence, “oh if only I was down there swimming”. Sadly this isn’t possible most of the year and especially so in the Wet Season. Those beautiful waters are home to stingers which can kill you and they pull out about 200 crocodiles a year, bearing in mind they’re the ones they trap (and relocate). Of course there are no doubt sharks out there too but with the other two “deadlies” out there, what’s a shark between friends. I can count on one hand the number of times I’ve swum in the harbour since we arrived in Darwin over a decade ago. I had business papers to read on the flight so the 3.5 hours of the flight passed quickly among the clouds. To add icing to the flight-path cake, on approach to Brisbane we came in from the west, which again doesn’t happen all that often. Usually the approach of Darwin flights is from the east over Moreton Island and the Brisbane river and mangrove flats. Yesterday we followed the river’s serpentine path as it flowed past The University of Queensland where I’ve spent many years of my life, parallel to the CBD with my old school off to one side a little, and the Gabba where Brisbane’s major cricket matches are played. We then angled around to come in over Teneriffe and Newstead House. All in all a wonderful aerial tour of two cities I’ve lived in for many years, topped off by a smooth landing by the Qantas pilot. 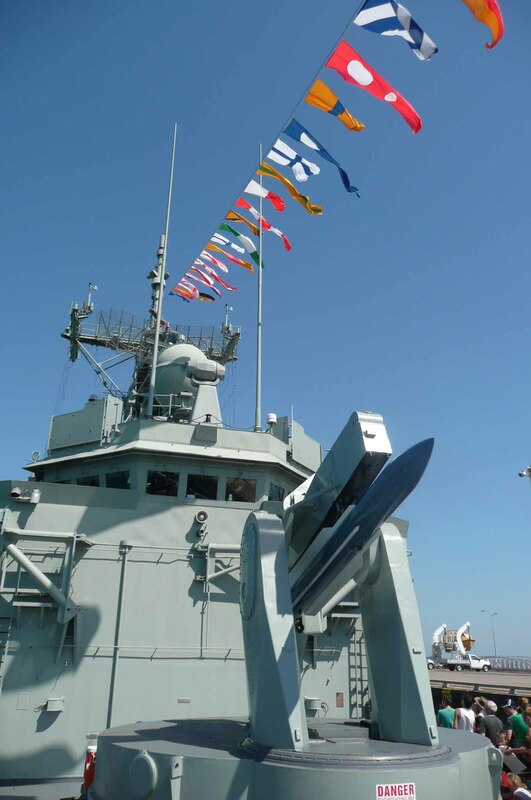 HMAS Darwin in Darwin: the flags might look pretty but that missile launcher is serious business! The Navy was in full-profile in Darwin town this long weekend. We missed the Keys to the City ceremony on Saturday but went with a daughter and small grandsons to see the HMAS Darwin on open public display yesterday. Although it was hot and at times slow, we had a great time seeing over the Australian Navy’s HMAS Darwin. Small boys, parents and grandparents were pretty impressed when the missile launcher showed its super rapid and automated response. I would certainly not want to be on board or anywhere nearby when it was all done in earnest: with the LNG gas plant and tankers in the background you realise just how much damage could be done! You also have to admire the ability of the able seamen to navigate those rather steep stairs at speed. Small boys have gone away very proud of the HMAS Darwin hat and badge and adult people happy with an interesting outing. 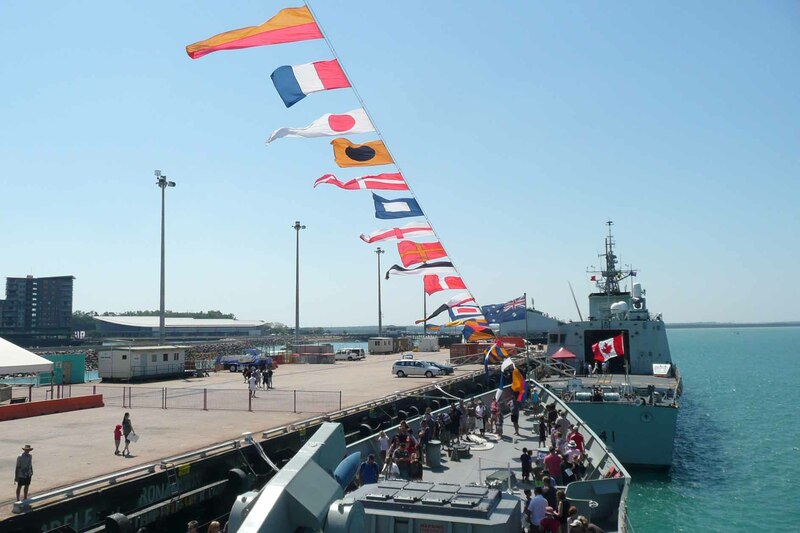 From the bridge of HMAS Darwin with the Canadian Navy's ship on view. HMB Endeavour contrasts with the gas tanker and sailing boats. 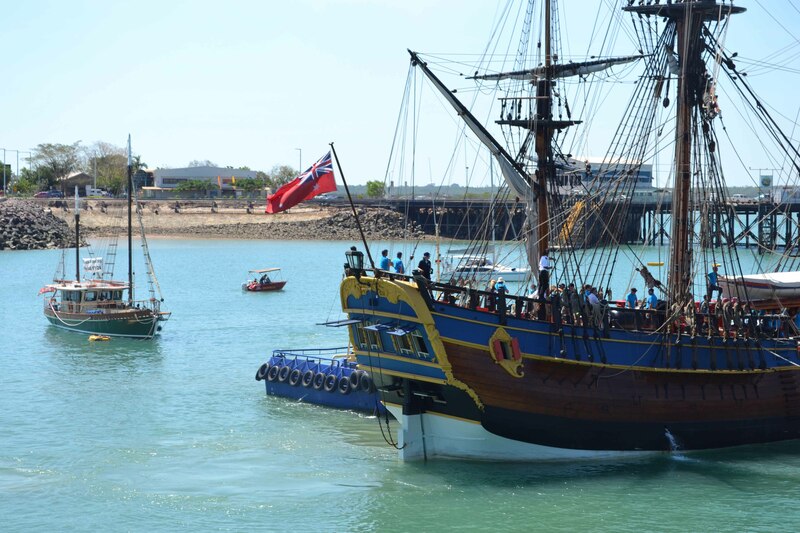 Then today the replica of HMB Endeavour also motored into Darwin harbour. Although we’d been on the lookout for it nearby we didn’t see it under sail at all but it was still exciting to see something so evocative of Australia’s white history. Perhaps less so for our indigenous Australians but an eventful moment nonetheless: I’ll be curious to see what the Tiwi people thought when they saw it off Melville Island. 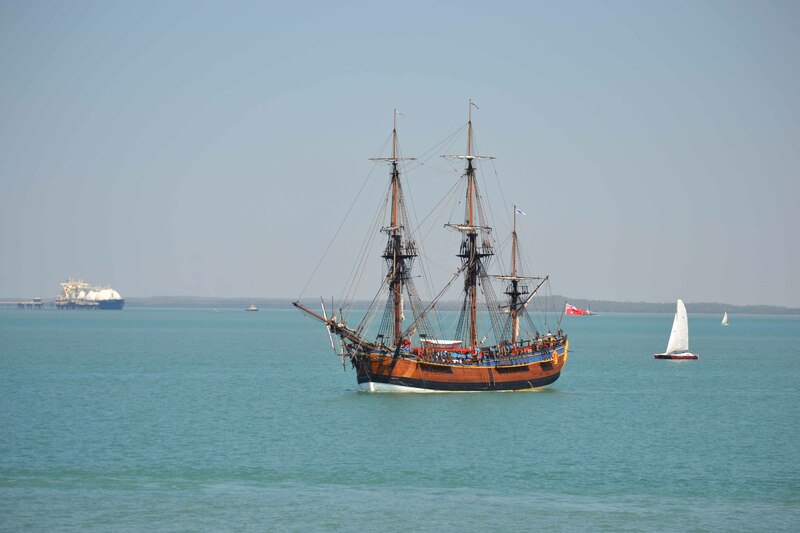 Darwin had anticipated Endeavour would be anchored off Fannie Bay last night and there seemed to be a very large number of “Endeavour picnics” awaiting its arrival. However it still could not be seen when dark fell so it was a pleasure to see it arrive this morning. As it came into Fort Hill then Stokes Hill wharves, Endeavour was pushed and navigated by tugs and its C18th century design contrasted with the sailing boats, speed boats, tugs, trawlers, barges and gas tankers. It is now berthed securely on the inner harbour of Stokes Hill wharf, which took a bit more kerfuffle than Cook would have required given there were no wharves etc in Oz in his time. We’re really looking forward to seeing over it and taking the taller of the grandchildren to see it (they need to be >90cm). Echoes of a recent royal wedding; Endeavour has a very pretty stern. 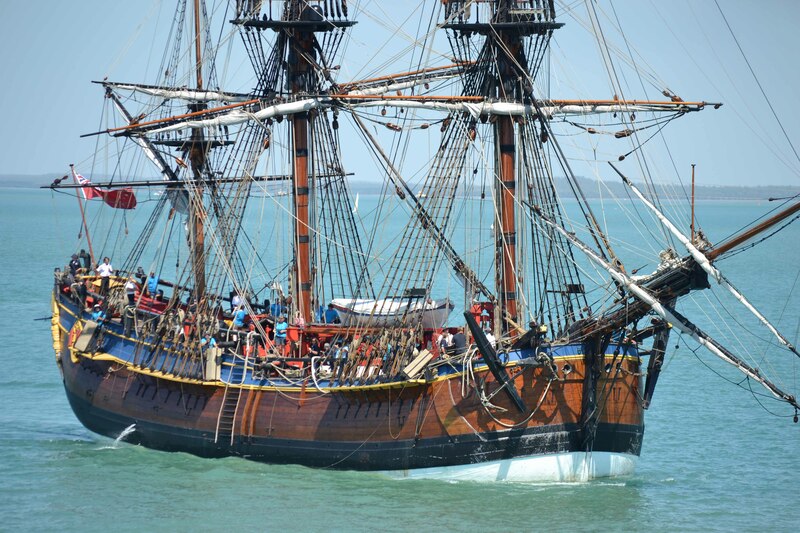 For the non-Australians reading this, HMB Endeavour stands for His Majesty’s Bark (or Barque) Endeavour, a faithful replica of the ship in which Captain James Cook “discovered” Australia in 1770. The replica is currently part-way through a circumnavigation of Australia. 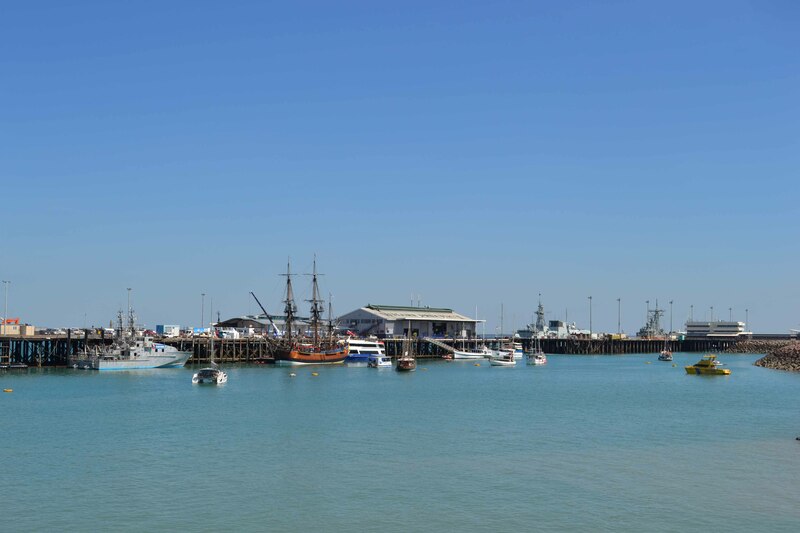 HMB Endeavour (replica) at Stokes Hill Wharf with HMAS Darwin on the far right at Fort Hill wharf.